UK Blu-Ray/All Region pressing. 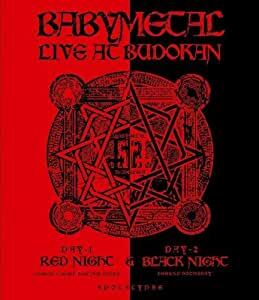 In March 2014, Babymetal performed in front of 20,000 people at the legendary Budokan venue - setting a record for being the youngest female fronted band to ever sell out Nippon Budokan on two consecutive nights. Both shows are arranged with a crystal clear sound thanks to the mastering by acclaimed studio guru and multiple Grammy winner Ted Jensen of Sterling Sound. 2015 finally saw the official album release of Babymetal's debut in Europe - a release that made waves all over the continent. What started with a cover story in prestigious Metal Hammer UK and full length features in all major European magazines, found its peak with being awarded Breakthrough Band at the Metal Hammer Golden Gods Awards 2015 and The Spirit Of Independence Award 2015 by Kerrang! Magazine. Followed by celebrated live performances at this year's Reading and Leeds, a surprise performance with Dragonforce at Download Festival as well as sold-out Europe shows, this year's success is now being completed with the release of these live shows.